When Mary Anning was just a year old, a traveling circus passed through Lyme Regis where she lived, and everyone flocked outdoors to see it. A severe thunderstorm began, so the story goes, and the woman holding Anning was struck by lightning and killed, but little Mary Anning survived. According to her family, the sickly baby girl became much smarter and livelier as a result. Her intelligence served her family well. She made the most of Sunday school lessons where she likely learned to read and write, and she began collecting and selling fossils (in those days variously nicknamed vertiberries, snake stones, ladies' fingers and devil's toenails) while still a child. From Rocks and Fossils by Arthur B. Busbey III, et al. Lyme Regis was an excellent spot to hunt fossils. Roughly 200 million years ago, the area lay near the equator, at the bottom of a tropical sea. Sea-floor mud often buried marine animals, preserving them for eons. In the 8th century, some scrappy humans saw fit to establish a village near the frequently fierce ocean waves. In Anning's day, the town had a main street "almost hurrying into the water," according to Jane Austen, and bad storms could scrape away half the village. The Anning family lived so close to the ocean that seawater regularly pounded on their windows, and sometimes flooded the tiny house. But the same waves that frequently made life treacherous for locals exposed ancient animals. Today, Lyme Regis still fills a thin strip of land bordered by cliffs that regularly surrender fossils, and now amateurs are allowed to collect fossils from loose rocks along the beach. Amateurs are also allowed to dig along the cliffs, although only with a permit. Mary Anning likely acquired her love of fossil collecting primarily from her father, Richard. He took increasing time away from his carpentry business to hunt for fossils along the rockfall-prone slippery shore, and he often took Mary and her brother Joseph with him. Weakened by a fall from a cliff, Richard succumbed to tuberculosis and died when Mary was just 10 or 11. Without her father, Mary resumed combing the beach for fossils. In a story that sounds as apocryphal as the lightning strike, on her first fossil outing by herself, Anning encountered a tourist who paid half a crown for a pretty ammonite she had just found. Some accounts also contend that Mary's early success came when her own mother was so grief-stricken that she was almost negligent, but Mrs. Anning (also named Mary, and nicknamed Molly) actually hunted for and sold fossils in her own right, a fact that science historian Hugh Torrens has documented clearly. Molly helped keep the family afloat after her husband's death. Every penny counted because the family was deeply in debt, and Molly was pregnant. Years later, Anning continued selling fossils, often ammonites, often to tourists, at Anning's Fossil Depot in Lyme Regis. Like her mother, the younger Mary Anning was a commercial collector, but at that time, the commercial market for fossils was not what it is today. (No one would fork over several million dollars for a T. rex skeleton then.) She occasionally sold fossils for a tidy profit — perhaps 100 or 200 pounds, which might translate into $200,000 to $400,000 today. Yet she often fell on hard times, sometimes because she couldn't find fossils, and sometimes because the public took no interest in what she did find. Gentlemen geologists occasionally came to her aid. Anning's most generous acquaintance may have been Lt. Col. Thomas James Birch (later Bosvile) who, when the Annings were desperately selling furniture to make rent, auctioned off the fossils he had previously bought from them and gave the Annings the auction proceeds. He wrote a friend about his regret at parting with his fossil collection but knew the money would be "well applied." Years later, geologist and amateur artist Henry De la Beche went so far as to paint "a more ancient Dorset," a cheerful depiction of marine life, representing many of the fossils Anning collected, to rouse public interest in her fossils. (Occasional rumors linked De la Beche and Anning romantically, but these might have stemmed from the simple fact that De la Beche, unlike some of his contemporaries and even close friends, was willing to acknowledge Anning's role in science.) After De la Beche's intervention, she fell on hard times again, losing her life savings after a bad investment. Members of the British Association for the Advancement of Science convinced the British government to award her a civil list pension of 25 pounds per year. Although wealthy fossil collectors often had fossils named after them, no British fossil was named for Anning during her lifetime by a fellow Brit. Louis Agassiz named two fossil fish species after her: Acrodus anningiae in 1841, and Belenostomus anningiae in 1844. In 1995, Torrens and Michael Taylor reported that Anning was yet to be commemorated in the name of a British fossil reptile. Anning is often credited with finding the world's first ichthyosaur, but other specimens had already been found. Moreover, it was actually her brother who found it. Because Joseph Anning was committed to an upholstery apprenticeship, he apparently suggested his sister find the rest of the fossil. She reputedly carried out the excavation herself at the tender age of 12, or else hired workmen to excavate it. Science writer Brenda Maddox recounts that "the whole town" knew about the big fossil, so Anning probably didn't lack for help. Anning's ichthyosaur was the first to attract the attention of London's gentlemen geologists. Henry Hoste Henley learned about her find from local reports, bought it for a handsome sum, and gave it to another gentleman geologist for his own natural history museum. Within a few years, the British Museum bought it. And Anning may have found the world's first recognized ichthyosaur coprolites. What she initially thought were bezoars (stomach stones) proved even more revealing when she broke them open and found fossil fish scales and teeth inside. She was lucky to find coprolites still lodged inside their makers. 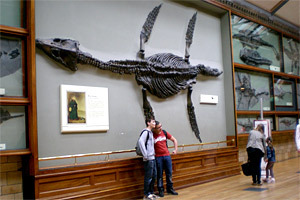 Anning's second plesiosaur at the Natural History Museum, London. Photo by Michon Scott. Tribute to Anning at the Sedgwick Museum, Cambridge. Photo by Michon Scott. Anning's ichthyosaur fossil find became the basis for six papers — all of them stuffy and erroneous — by Everard Home. More skilled anatomists started calling the fossil Ichthyosaurus around 1820. About that time, Anning found the world's first nearly complete plesiosaur, described by William Conybeare and De la Beche. With its little skull on the end of a long neck, the plesiosaur was considerably weirder than the ichthyosaur, which at least looked crocodilian. Geology professor William Buckland described the plesiosaur as "a serpent threaded through the shell of a turtle." In 1829, Anning found a second complete plesiosaur, which is on display in the Natural History Museum, London. The same year, she also found a fossil fish, Squaloraja, later interpreted as a transitional species between sharks and rays. She dissected a modern ray to give herself a basis for comparison. 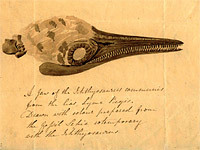 Philpot's sepia illustration of an ichthyosaur skull. From: Mary Anning, FRS? Beyond ichthyosaurs and plesiosaurs, Anning also found the first recognized pterosaur fossil in England (Mantell found pterosaur remains before Anning, but attributed them to a bird). Anning also found fossil cuttlefish that, amazingly, retained their original sepia (ink ejected to thwart predators). Elizabeth Philpot, a wealthy collector and friend of Anning's, used the sepia in illustrations, and Buckland recounted how a "celebrated painter" described the fossil ink as "of excellent quality." The extraordinary thing in this young woman is that she has made herself so thoroughly acquainted with the science that the moment she finds any bones she knows to what tribe they belong. She fixes the bones on a frame with cement and them makes drawings and has them engraved. . . . It is certainly a wonderful instance of divine favour — that this poor, ignorant girl should be so blessed, for by reading and application she has arrived to that degree of knowledge as to be in the habit of writing and talking with professors and other clever men on the subject, and they all acknowledge that she understands more of the science than anyone else in this kingdom. 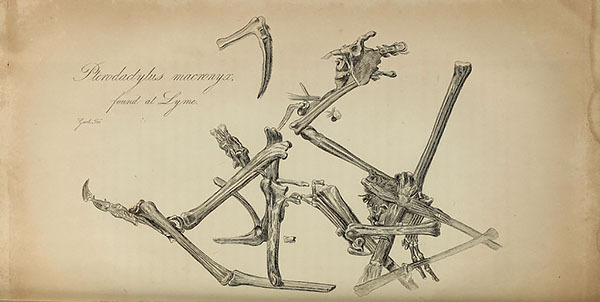 Top: Engraving of Pterodactylus macronyx, the pterosaur found by Anning. Image provided by Biodiversity Heritage Library (some rights reserved). Bottom: Stained-glass window commemorating Anning at St. Michael's Church, Lyme Regis. Photo by Michael Day (some rights reserved). As Anning matured and began to appreciate her own contributions to science, she grew resentful of the scientists who failed to acknowledge her work. She was rumored to detest Buckland's interpretations of fossils, but no evidence can be found in her correspondence to him, which was usually congenial. Like De la Beche, Gideon Mantell was inclined to recognize her contributions (though he once described her as a "prim, pedantic vinegar looking female"); William Conybeare was less so. Roderick Impey Murchison must have been kinder to Anning than most as she lionized him in a whimsical poem that poked a little fun at Adam Sedgwick and William Buckland. In fact, Anning was close friends with Murchison's wife Charlotte, and stayed with the couple on what might have been her only visit to London. Anning got off to a bad start with Georges Cuvier, who initially thought the plesiosaur she found was a composite of different animals. He was finally reassured of its authenticity by Buckland and Conybeare, and eventually acquired one of her plesiosaurs. Fossils collected by Anning are still on display in the natural history museum in Paris. [A] woman of low social class and little education could become famous for her own collecting activities and make a modest living from such work: Mary Anning of Lyme Regis in southern England was celebrated among a later generation of savants for her skill in discovering the finest specimens of fossil reptiles, though she did not have the expertise to interpret them scientifically. Lithograph of Anning's first plesiosaur, in Transactions of the Geological Society . From "Mary Anning (1799-1847) of Lyme: 'The Greatest Fossilist the World Ever Knew'" by Hugh Torrens. She read everything and anything she could acquire on fossils, even though she was often able only to borrow the original publications. In these instances, she frequently copied out the entire article, including illustrations, and there are several examples of these in the archives of London's Natural History Museum. One in particular so haunted me that I obtained a Xerox copy. I have it in front of me as I write, alongside a copy of the original. It is a paper on marine reptiles, written in 1824 by William Conybeare, arguably the brightest geological light in England at that time. There are eight full pages of illustrations, and I am hard-pressed to distinguish the original from the copy. . . . Indeed, Anning was far more than just a collector of fossils. She analyzed her finds, often comparing the anatomies of the fossils with those of their living relatives. In one case, she obtained two specimens of the cuttlefish, a close relative of the squid, to compare with fossils of cuttlefish from the Blue Lias. One of them was still alive, and she wrote that, "whenever it was touched [it] ejected a purple fluid" . . . Anning dissected the second cuttlefish specimen, observing that it had an "ink bag exactly resembling the fossil one" as well as "a second small bag (like the gisard of a fowel) containing a number of horny triangular little pieces (I should think to assist its digestion)" This was an astute observation of the buccal cavity (mouth), which has minute horny teeth for breaking up food. Anning had a short and often difficult life. The family had always been poor. Out of at least nine children, Anning and her brother were the only ones to survive to adulthood; she was actually named after a sister who died shortly before the younger Mary was born. Her father was a Dissenter (of another faith than Anglican), which, in early 19th-century England, could be a major impediment to worldly success. Anning eventually converted to the Church of England — a practical decision since many of her customers were Anglican, but the move was probably motivated by genuine faith, too. (Her brother also converted.) 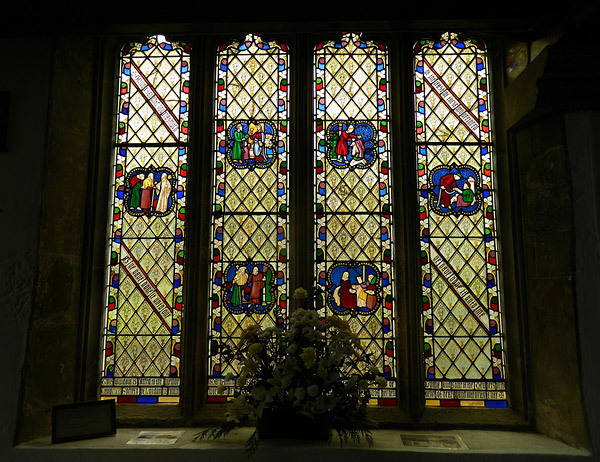 After her death, a stained-glass window was unveiled in the Lyme Regis church of Saint Michael's commemorating her devotion to the local poor. Some of the same factors that made Anning's life difficult have also made documenting her life difficult for later historians. In his presidential address to the British Society for the History of Science, Hugh Torrens described some of those factors, noting that she was working class, female, unmarried, solitary and, "a doer, not a writer. Anning published nothing under her own name." Larry Davis of St. John's University points out that she actually could count one published item to her name; The Magazine of Natural History published a portion of her letter to the editor about her discovery of the jaw of the extinct shark Hybodus delabecheii. Anning had the good fortune to live where fossils eroded out of the shoreline, and she had the intelligence to recognize their significance. Still, the work was dangerous; rock falls could happen at any time. She narrowly escaped a landslide that killed her dog, and barely missed being crushed by a runaway cart. An acquaintance remarked that Anning read the Bible more often after one such brush with death. In the end, she died in her 40s of breast cancer, and likely spent much of the last months of her life bedridden. Her death, some locals noted, actually precipitated a drop in visitors to Lyme Regis. It had the head of a lizard, the teeth of a crocodile, a trunk and tail of the proportion of an ordinary sized quadruped, the ribs of a chameleon, the fins or paddles of a whale, whilst the neck was of an enormous length resembling a serpent attached to the body. Further recognition for Anning came more than a century after her death. The Royal Society of London didn't admit women until 1945, but in 2010, when the Society marked its 350th anniversary, it asked a panel of female society fellows and historians to name the 10 most influential British women in the history of science, and they included Anning. Four years after that, on May 21, 2014, Google commemorated Anning's 215th birthday with a special doodle. Rocks and Fossils by Arthur B. Busbey III, et al.